The number of federal lobbying disclosures that mention the U.S. process for vetting foreign investments has surged amid overhaul steps taken since President Donald Trump took office, according to data compiled by Bloomberg Government. The topic was cited in 139 lobbying reports in the first quarter of this year compared with 18 in the first quarter of 2017, an increase of more than 600 percent. 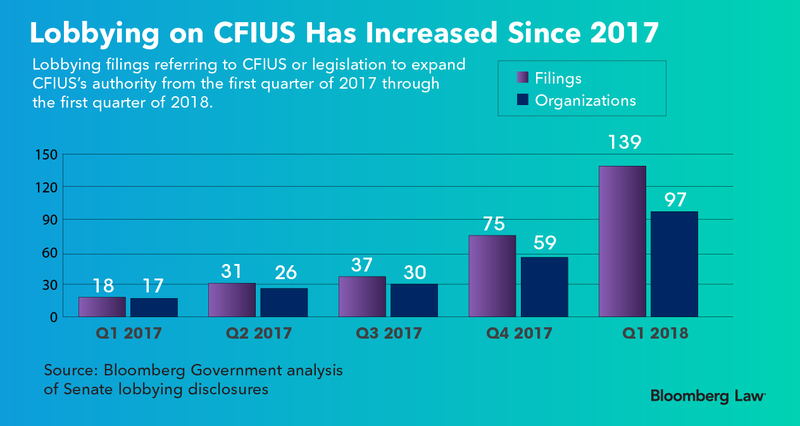 Nearly 100 organizations lobbied in Washington on CFIUS-related issues during the first quarter of 2018, according to the Bloomberg Government data. The list includes International Business Machines Corp., Intel Corp., Microsoft Corp., the U.S. Chamber of Commerce, the Business Roundtable, and the Motion Picture Association of America. Some had multiple filings. The figures reflect the huge stakes involved for businesses as Congress and the Trump administration work to expand the purview of the Committee on Foreign Investment in the U.S. (CFIUS), a multiagency panel that reviews cross-border deals for their impact on national security. CFIUS overhaul legislation began taking shape last year as lawmakers grew increasingly worried about Chinese efforts to acquire U.S. technologies. The legislation has gained traction in recent months and now appears to be on a fast track toward final passage. The Senate version has been added to must-pass spending legislation for the Defense Department. The Business Software Alliance is among groups that successfully lobbied to defeat a provision targeting technology-related joint ventures between U.S. companies and their overseas partners. That language was excluded from the bills that are now moving through both chambers of Congress with strong bipartisan support. “We understand that there’s a strong desire to move legislation forward, but we wanted to make sure it could be done in a way that wouldn’t have unintentional consequences for regular business activities,” Craig Albright, BSA’s vice president of legislative strategy, told Bloomberg Law. BSA’s work on CFIUS started in the second quarter of this year and will be reflected in the association’s next lobbying disclosure to Congress, a spokeswoman said. Businesses have seen a flurry of both regulatory and legislative activity related to CFIUS over the past several months. Trump issued an executive order in March blocking Broadcom Ltd. from acquiring Qualcomm Inc., scuttling a $117 billion deal. The president’s order came after an investigation by CFIUS, which had said Broadcom’s acquisition would undermine Qualcomm’s leadership in 5G wireless technology. Lawmakers introduced companion bills in the House and Senate in December to expand CFIUS. The Senate Banking Committee and House Financial Services Committee last month approved revised measures after a number of hearings and months of negotiations to resolve business community concerns. Under the original language, outbound investments by U.S. companies via arrangements such as joint ventures would have become subject to CFIUS oversight for the first time. CFIUS focuses on inbound investments in which a foreign acquirer seeks control of a U.S. entity or assets and it would continue to do so under the legislation. But the current House and Senate versions of leave outbound investments under the jurisdiction of an “export control” regime run by the Commerce Department. The change was a major victory for industry groups, whose concerns were initially rebuffed by the main bill sponsors. “We support the broad consensus that the Committee on Foreign Investment in the United States (CFIUS) should focus exclusively on assessing the national security risks of inbound investments, while export controls should address national security risks associated with outbound technology transfers to countries of concern,” said a May 21 letter signed by BSA, the Information Technology Industry Council, the U.S. Chamber of Commerce, and the Business Roundtable, among other groups. Tech firms will continue to be engaged as the legislation moves forward and even after it is passed, Albright said. “I think the companies will be eager to participate in the process of updating the export control system,” he said.